Only in anime can most of the male population be decimated. In honor of Yuru Yuri’s third season starting, it will be the topic for today. 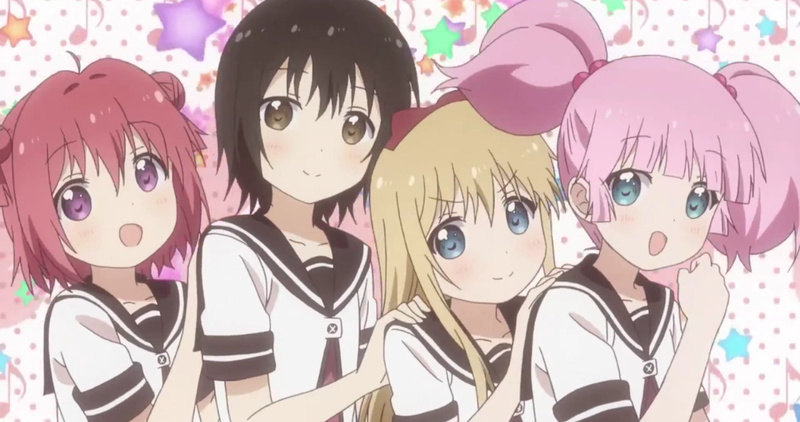 On the outside Yuru Yuri seems like another cute girl, slice-of-life comedy with bits of yuri sprinkled in. Though closer examination of the world of Yuru Yuri reveals a disturbing secret. As many fans have pointed out, there seems to be a severe lack of males present in Yuru Yuri’s world. In fact there are almost zero. There are many fan theories on why this is. After thorough research on this topic, I have come up with some theories of my own on what I think is going on in this male-free world. A Theory: The Y chromosome has been eradicated. I have two explanations for this A theory. The first is that a disease came about that only affected those with a Y chromosome. This plague and its aftermath was so terrible, what remained of humanity (the females) decided to repress all information of this ever happening and just go on with life like nothing happened. The second is that for some reason, mass genocide was committed against all males, and the aftermath was so traumatic for those who remained that - like the plague scenario- all information about it was repressed and forgotten, and life continued on. Actually in retrospect those two are pretty much the same, so either way, all males were killed in some tragic event. Side note: Let’s just forget that one Christmas episode where there are male and female couples. That was all clearly a dream. Stop it, that did not happen. It’s clearly a dream because none of the males have faces. Or maybe they are all female and some of them look male from behind. Keeping these two explanations in mind, there are only two results that can come from these options. Either this world will need to figure out how to make life without males; or the darker option, this will actually be the last generation of our species before the human race becomes extinct. The entire show actually takes place on another planet and all the characters are a species of aliens that all happen to look female. It also coincidentally takes place in a country on that planet that just happens to be called and looks exactly like Japan, complete with a similar culture and life style. Why didn’t I see it before? It was literally right in front of us. Or maybe this show takes place in a parallel universe, were males just don’t exist. Though that would bring up more questions on how this world operates, but let’s leave it at that.